The Butterfly Bush, once a favorite plant with children for the hordes of beautiful butterflies it attracts, has had some bad publicity in the last few years. Beautiful as it is, these plants produce a lot of seed, and this will easily spread and grow just about anywhere. In some parts of the country it grows where it is not wanted, and interferes with the natural ecology of the surrounding countryside. In the last few years there has been a lot of concern with this issue, and in some states, most notably Oregon, the sale of these plants has been stopped, because the invasive habits of the plant have caused such problems. To be clear, there is nothing harmful to humans or pets about these plants, and many biologists recognize that they can be a valuable food source to lots of different species of butterflies and moths. It is just that when they escape by seed into natural areas, they prevent the normal development of native plants, including forest trees in areas which have been logged. They also grow along rivers and streams, again interfering with the growth of native plants. Can you Grow these Plants Safely? Since the Butterfly Bush can only escape into natural areas as seed, then one clear way responsible gardeners can prevent that spread is by removing flowers heads as soon as they have faded. Even if you don’t get to them right away, most if not all the seed is released in winter, so as long as you cut down your plants in fall, and destroy the seed heads, they cannot spread. It is however better to remove the flowers earlier, so that there is no seed inside the heads, which could be spread from compost, for example. 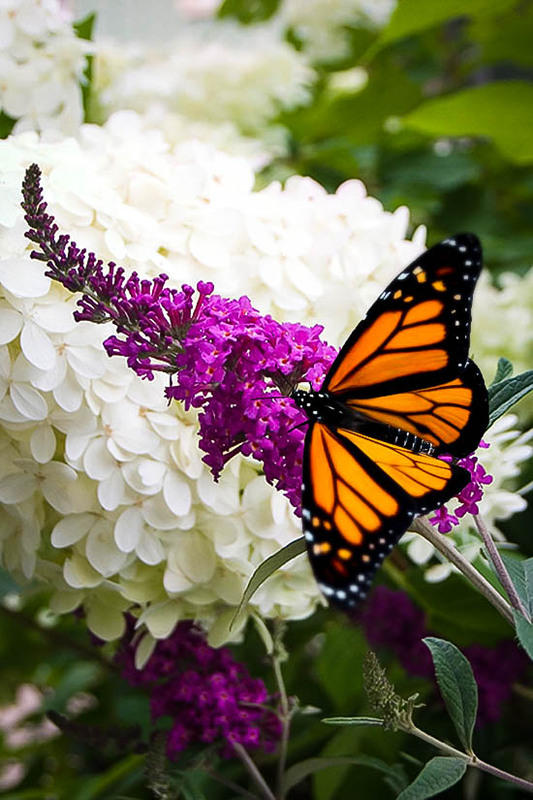 If you are a responsible gardener, and conscientious about removing flower heads promptly, then you can continue to grow all the traditional varieties of butterfly bushes, such as the popular red variety, ‘Royal Red’, or the rich purple ‘Black Knight’. For large pink flower heads, the variety ‘Pink Delight’ is sure to please. If you live in a state that has no banned these plants outright, or if you live in the central and northern mid-west, where it is too cold for these plants to survive a winter outdoors, then if you dead-head, you can grow these plants with a clear conscience. By the way, if you do live in an area which is too cold, you can lift the plants in the fall, place them in a pot, and once early winter has arrived, and the plants are fully dormant, simply store them in a cold place – it doesn’t have to have any light, as the plants have no leaves in winter – and bring them out and re-plant in spring. They will quickly sprout and be blooming in no time at all. The storage place can be a few degrees about freezing, or well-below it. Anything from zero degrees to 40 degrees will be fine. Keep the soil just barely damp, and the plants will survive perfectly. Even if you feel you can reliably remove the old flowers, you may still be reluctant to grow these plants. Many of us want to send the message to our friends and neighbors that we care about the environment, so we just won’t grow at all any varieties that could produce seed. You might live in Oregon, where there is an outright ban on these plants, so the option of growing them, even if you do remove seeds, is not available to you. In that case, you will not want to grow the traditional varieties, but there is good news. Not wanting to lose these plants in gardens, several colleges and private plant breeders have set about producing new varieties that do not produce seed. That’s right – Butterfly Bushes that produce no seed and therefore cannot spread into wild places. These plants are perfectly safe to grow. In fact, they are so safe that even in Oregon, the state authorities responsible for the environment have agreed that they can be safely grown and sold. To avoid confusion, they are sold in that state as ‘Summer Lilac’, because the flowers look a little like the flower spikes of lilac bushes. Often the colors are lilac, blue or purple, very similar to the colors we find in varieties of the true lilac. The name ‘Nectar Bush’ is also used for some varieties, in tribute to the copious quantities of nectar produced by these plants. It is this sweet nectar that makes them so attractive to butterflies, and means these plants help many of these gorgeous insects to survive. Summer Lilacs come in a dazzling array of colors. There is bright blue, in the variety ‘Blue Chip Jr.’ There is bright pink, in the lovely ‘Miss Molly’, and there is rich purple-red in the charming ‘Miss Ruby’. These are just a sample of the best varieties, but in total there are currently18 different varieties permitted in Oregon, the state with the strongest controls. These come in many colors, from white to purple, in many shades of blues or pinks, and in peach and orange shades too. Further new varieties are sure to follow over the next few years. The varieties already mentioned are perfect choices for a ‘safe’ Butterfly Bush, but other ones you will know are safe, if you see them available, could include the word ‘Miss’ in the name, or the word ‘Chip’, or they may be sold as part of a series called Flutterby Grandé. Most of these were produced by breeders at North Carolina State University, in Raleigh. Gardeners who love Butterfly Bushes owe a big ‘thank-you’ to these hard-working professionals, who have solved the problem of the spreading Buddleja. They have brought us all, wherever we live, a way of growing these sweetly-scented, charming plants. We can continue to feed our local butterfly populations, and at the same time protecting our local environments. A new generation of children can grow up playing in gardens where these plants attract such spectacular insects, and help teach a new generation about the wonders of nature – and also that we can garden responsibly, without giving up beauty. I have beautiful trees in my yard and I call them butterfly trees but I can’t find the botanical name. They look tropical but are Hardy. If you know the name, I would love to have it. Love to help you, but can’t really tell from your description. Are you sure they are not panicle hydrangea? They turn pink in the cold weather, but the blue seed has me stumped – sorry!